It is not uncommon for buyers and sellers to be confused when trying to understand each line item on their HUD settlement statement. These items at times can be perplexed when it isn’t something seen everyday. The HUD settlement statement is basically the receipt for the real estate transaction, so it is very important to have an absolute understand. 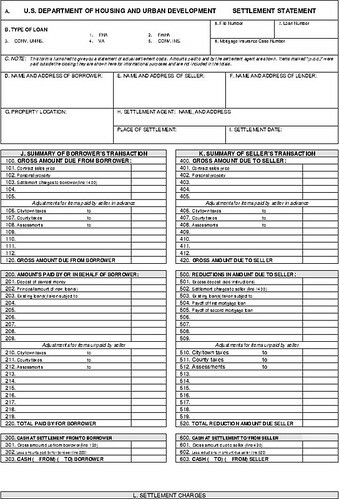 One of the first aspects to understand when looking at a HUD settlement statement is to be able to differentiate the difference between what is paid at closing and what is paid outside of closing. Paid outside closing (POC) costs are simply costs that have been paid prior to the final settlement date. These costs are most common with an appraisal and an inspection, as well as a credit report or survey. These fees should always have been disclosed to the borrower on the Good Faith Estimate (GFE) and should not come as a surprise. They are simply non-finance, third party charges that can be viewed as paid out of pocket expenses. If you bought a house with cash, you probably still would get these non-finance charges. At the day of closing, these could also include most title services, real estate taxes, hazard and flood insurance and title insurance. It is important to note that although owner’s title insurance is optional in the state of Florida, it is customary for the sellers to pay this cost for the buyers. However, lenders title insurance is not optional and must be paid on all homes being financed. Something else that is customary in the state of Florida for the sellers to pay is the state tax/doc stamps. As most Florida residents know, there is no state income tax in Florida. Therefore, revenue is generated from sales tax, and real estate is no exception. This causes real estate transactions to cost a lot more than other states that don’t have this tax; and this cost is passed down to the seller to incur. Real estate property taxes on the other hand are pro-rated to the buyer. As far as hazard and flood insurance, these can be paid either before closing or at closing. If paid at closing, the title company will pay the insurance company(ies) on the buyers behalf from the money brought to closing. The other aspect to understand when reviewing a HUD settlement statement is what prepaid finance charges (PFC) are. These annual percentage rate (APR) affecting fees are charges paid at closing in connection with financing a home instead of paying for it in cash. If you finance a home, you will pay in addition to the aforementioned fees, finance charges that can include, origination, discount/points, interest, mortgage insurance, processing, underwriting, wire fee, and flood determination fees. Not sure who to call or where to start? Contact me today for a 100% free no-obligation loan inquiry analysis. Posted on July 1, 2013, in Finance and tagged AHUD Settlement Statement, Closing Costs, Finance Me, Fort Myers, GFE, Good Faith Estimate, HUD-1, Lender, Loan, Matt Pell, Mortgage, Mortgage Warehouse, Paid outside closing, PFC, POC, Prepaid finance charges, Property Guiding, Real Estate Financing, SWFL Real Estate, Title Insurance. Bookmark the permalink. Leave a comment.